Coat chicken in 2 tablespoons of the oil; rub in taco seasoning mix. Heat 12-inch nonstick skillet over medium-high heat. Add chicken; cook 1 to 3 minutes on each side or until browned. Remove chicken from skillet. Add remaining 1 tablespoon oil. Add bell pepper, onion and salt; cook 5 to 7 minutes, stirring frequently, until vegetables soften and begin to brown. Add broth; heat to boiling. Stir in rice; return to boiling. Place chicken over rice. Reduce heat to low; cover and simmer 20 to 25 minutes or until most of liquid is absorbed, rice is tender and juice of chicken is clear when center of thickest part is cut (at least 165°F). Drizzle mixture with lime juice; sprinkle with cilantro. Leave it alone! Keep the lid on the skillet for at least the first 20 minutes as the rice cooks. If you remove the lid to check on it, you release heat and steam that are crucial for perfect, yummy rice. Like it hot? Top with hot sauce or sliced pickled jalapeños for a little extra heat. 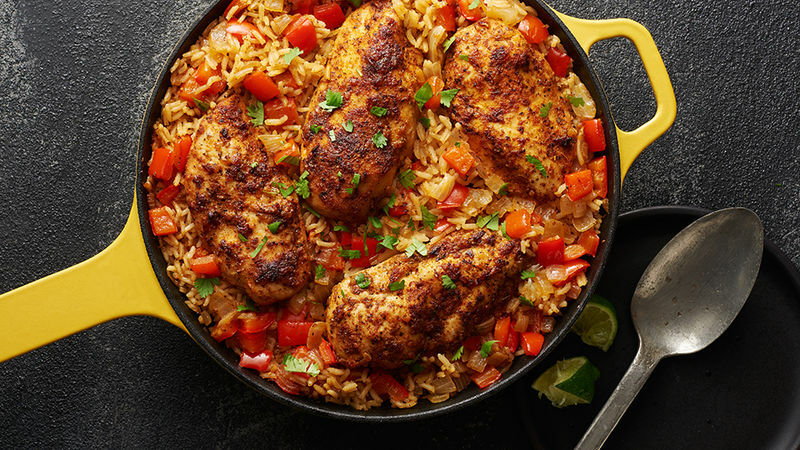 When it comes to Mexican dishes, flavor is everything, and this Mexican chicken recipe is just as big on flavor as it is short on cleanup. You can thank Old El Paso™ chicken taco seasoning mix and a healthy sprinkle of fresh cilantro for that.